Neil Kilkenny and Luciano Becchio were on target as leaders Leeds notched their fifth straight league win. Ex-Oldham favourite Kilkenny opened the scoring when he burst into the six-yard box to bundle in Max Gradel's cross. Leeds had several chances to increase their lead but Oldham keeper Darryl Flahavan kept his side in the game with a string of fine saves. Argentine Becchio sealed the win late on when he latched on to Gadel's astute pass and finished neatly from 10 yards. "It was a good victory for us - a clean sheet and two goals in an away performance. "For the first 20 minutes we were a little bit under the cosh and didn't play as well as we could but we got the goal and looked very positive from then on. "We looked an accomplished team - we worked hard and on another night we should have been three or four up." 90:00+2:55 The referee blows his whistle to end the game. 89:55 Free kick taken by Neil Kilkenny. 89:55 Substitution Dale Stephens replaces Dean Furman. 89:55 Robert Snodgrass fouled by Dean Furman, the ref awards a free kick. 88:53 Inswinging corner taken left-footed by Robert Snodgrass from the right by-line, Sean Gregan manages to make a clearance. 87:40 The assistant referee flags for offside against Mike Grella. Darryl Flahavan takes the free kick. 85:57 Substitution Nick Blackman is brought on as a substitute for Keigan Parker. 85:57 Substitution Mike Grella on for Max Gradel. 81:35 Max Gradel provided the assist for the goal. 81:35 GOAL - Luciano Becchio:Oldham 0 - 2 Leeds United Luciano Becchio grabs a goal from inside the penalty box to the bottom left corner of the goal. 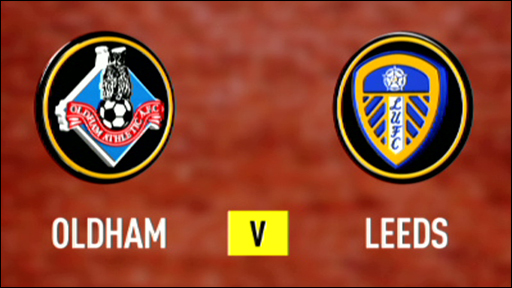 Oldham 0-2 Leeds. 80:11 Dean Furman has an effort at goal from outside the box which goes wide right of the target. 78:43 Robert Snodgrass takes a shot. Darryl Flahavan makes a brilliant save. 78:09 Keigan Parker gives away a free kick for an unfair challenge on Tony Capaldi. Casper Ankergren takes the free kick. 76:38 Substitution Ryan Brooke comes on in place of Deane Smalley. 76:12 Substitution Sam Vokes leaves the field to be replaced by Luciano Becchio. 72:58 Darryl Flahavan restarts play with the free kick. 72:58 Substitution Robert Snodgrass replaces Hogan Ephraim. 72:58 The offside flag is raised against David Prutton. 70:45 Effort on goal by Paul Black from outside the penalty box goes harmlessly over the bar. 68:22 Paul Heffernan has an effort from just inside the box that misses to the left of the goal. 66:09 Keigan Parker is flagged offside by the assistant referee. Casper Ankergren restarts play with the free kick. 64:04 Dean Furman challenges Max Gradel unfairly and gives away a free kick. Free kick crossed right-footed by Hogan Ephraim from left wing, save made by Darryl Flahavan. 62:42 Joe Colbeck fouled by Jason Crowe, the ref awards a free kick. The ball is crossed by Danny Whitaker, Joe Colbeck has a headed effort at goal from just inside the area that misses to the right of the goal. 58:53 Corner taken by Max Gradel, Sam Vokes produces a right-footed shot from close range that goes over the bar. 58:29 Corner from the left by-line taken by Max Gradel, clearance by Paul Black. 57:39 The free kick is swung in right-footed by Hogan Ephraim, clearance made by Kelvin Lomax. 57:39 Booking Paul Black goes into the book. 57:30 Max Gradel fouled by Paul Black, the ref awards a free kick. 56:44 Free kick awarded for a foul by Max Gradel on Kelvin Lomax. Free kick crossed right-footed by Kelvin Lomax, clearance by Jonathan Howson. 54:04 A cross is delivered by Kelvin Lomax, free kick awarded for a foul by Danny Whitaker on Jonathan Howson. Casper Ankergren restarts play with the free kick. 53:05 Sam Vokes is ruled offside. Direct free kick taken by Alex Marrow. 52:21 Hogan Ephraim sends in a cross, Header from deep inside the area by David Prutton goes over the bar. 50:54 Unfair challenge on Sean Gregan by Neil Kilkenny results in a free kick. Danny Whitaker takes the direct free kick. 50:05 The ball is sent over by Keigan Parker. 48:39 Centre by David Prutton, save by Darryl Flahavan. 47:59 Foul by Neil Kilkenny on Deane Smalley, free kick awarded. Direct free kick taken by Darryl Flahavan. 47:51 The ball is crossed by Hogan Ephraim, clearance by Sean Gregan. 46:55 Sam Vokes takes a shot. Save by Darryl Flahavan. 44:16 The ball is sent over by David Prutton. 43:42 Outswinging corner taken right-footed by Max Gradel from the right by-line to the near post, Danny Whitaker makes a clearance. 43:32 David Prutton crosses the ball, Paul Black gets a block in. 42:36 Neil Kilkenny restarts play with the free kick. 42:36 Booking Alex Marrow receives a yellow card for unsporting behaviour. 42:27 Unfair challenge on Hogan Ephraim by Alex Marrow results in a free kick. 41:00 Neil Kilkenny has shot on goal from just outside the penalty box which goes wide of the right-hand upright. 38:33 Max Gradel takes a shot. Save by Darryl Flahavan. 36:54 The assist for the goal came from Max Gradel. 36:54 GOAL - Neil Kilkenny:Oldham 0 - 1 Leeds United Goal scored by Neil Kilkenny from close range to the bottom right corner of the goal. Oldham 0-1 Leeds. 35:55 A cross is delivered by Jason Crowe, Hogan Ephraim challenges Kelvin Lomax unfairly and gives away a free kick. Darryl Flahavan takes the direct free kick. 34:25 A cross is delivered by Kelvin Lomax, clearance by Leigh Bromby. Correction - 33:17 Max Gradel is ruled offside. Indirect free kick taken by Darryl Flahavan. 33:17 The assistant referee signals for offside against Max Gradel. Direct free kick taken by Darryl Flahavan. 32:12 Sean Gregan concedes a free kick for a foul on Max Gradel. Direct free kick taken by Jason Crowe. 30:25 Sam Vokes takes a shot. Save made by Darryl Flahavan. 29:32 Max Gradel takes the inswinging corner, Deane Smalley manages to make a clearance. 28:55 Hogan Ephraim fouled by Dean Furman, the ref awards a free kick. Free kick crossed right-footed by Hogan Ephraim, clearance by Deane Smalley. Correction - 27:12 The referee blows for offside. Darryl Flahavan restarts play with the free kick. 27:12 The offside flag is raised against Leigh Bromby. Free kick taken by Darryl Flahavan. 26:36 Inswinging corner taken left-footed by Danny Whitaker from the left by-line, Leigh Bromby makes a clearance. 25:57 Alex Marrow fouled by Max Gradel, the ref awards a free kick. Darryl Flahavan takes the direct free kick. 24:50 Neil Kilkenny challenges Paul Heffernan unfairly and gives away a free kick. Darryl Flahavan restarts play with the free kick. 24:14 The ball is delivered by Hogan Ephraim, blocked by Kelvin Lomax. 22:27 Lubomir Michalik is adjudged to have handled the ball. Danny Whitaker crosses the ball from the free kick right-footed from left wing, clearance by Lubomir Michalik. Correction - 20:36 Effort on goal by David Prutton from long range goes harmlessly over the bar. 20:36 Danny Whitaker produces a right-footed effort from long distance that goes harmlessly over the bar. 20:09 Inswinging corner taken right-footed by Max Gradel from the left by-line to the near post, Paul Black manages to make a clearance. 17:03 The ball is swung over by Joe Colbeck. 15:07 A cross is delivered by Paul Heffernan, blocked by Leigh Bromby. 14:22 Effort from the edge of the box by Jason Crowe goes wide of the left-hand upright. 13:15 The ball is swung over by Joe Colbeck, clearance made by Lubomir Michalik. 12:54 The assistant referee flags for offside against Sam Vokes. Darryl Flahavan takes the free kick. 11:58 The official flags David Prutton offside. Free kick taken by Sean Gregan. 9:16 The ball is delivered by Joe Colbeck, Headed effort on goal by Dean Furman from inside the penalty box misses to the right of the target. 6:54 The ball is crossed by Joe Colbeck. 5:21 Free kick awarded for a foul by Neil Kilkenny on Dean Furman. Direct free kick taken by Kelvin Lomax. 1:27 Free kick awarded for an unfair challenge on Sam Vokes by Sean Gregan. Lubomir Michalik takes the direct free kick.